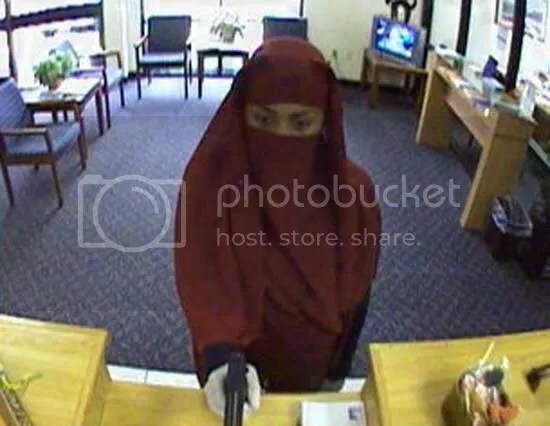 Mattress Firm’s Sharia compliant – Missouri – Manchester – burqa clad woman is refused service for security reasons. Manager fired. Sharia complied. Another reason why Sharia should be outlawed! This is not a nun. Nun’s are not known for wearing face covers. Nor have there been ANY arrests for nun’s robing or stealing or anything else, at least, not recently and not with any great amounts. I personally have not heard of any. However, burqa clad individuals seem to permeate the crime areas. New Jersey – Yet another Burqa Bandit – BAN THE BURQA now! 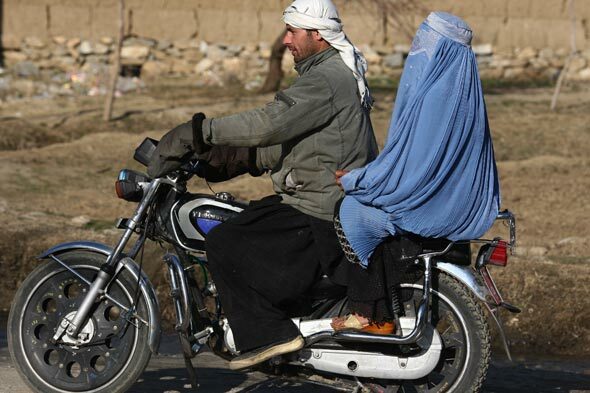 Pakistan – Ban the Burqa – Islamabad – Burqa clad (man/woman? the unknown. The faceless) militant detonated a suicide vest hidden beneath that righteous garment. \SARC intended. MANCHESTER, Mo. — Syeeda Hussaini has suffered from neck pain the past few years, to the extent that it’s difficult for her to drive and get a good night’s rest. So on a recent weekend, she, her husband, and their three kids loaded up the car and drove less than a mile to a store called Mattress Firm. Her husband, Mohammad, encouraged her to lie on different beds to see which one felt best. She said the store manager approached, but oddly didn’t want to help. He told the family that he wouldn’t sell them a mattress for security reasons, she said. Hussaini, 27, who is Muslim, covers all but her hands, feet and eyes in public to show respect for femininity and her religion. She said the manager told her she needed to show her face for service. Mohammad, a pathology resident at Barnes Jewish Hospital in St. Louis, tried to explain that his wife dressed this way to be modest, much like Catholic nuns. But the manager stomped off, they say. Hussaini wrote a letter to a regional representative of the company after the March 12 visit to the store. An official at Mattress Firm headquarters in Houston said the company “has a zero-tolerance policy on racial and religious profiling.” Spokeswoman Sunni Goodman would not comment specifically about the manager, but she confirmed the encounter happened. “As soon as we were informed of the incident, we took appropriate action to address the situation,” she said. The manager no longer works for Mattress Firm. Other retailers at the shopping plaza said it’s not unusual to see women fully covered. The Dar Ul Islam mosque, the most established of about a dozen mosques in the St. Louis area, is just a few miles away. There have been other recent complaints in the region. Advocates said emotions are running high since a Muslim community center was proposed near ground zero in New York and since a Floridapastor burned a Quran, the holy book of the Islamic faith. “It’s harder to be a Muslim in the United States now than at any time since 9/11,” said James Hacking III, a lawyer and head of the Muslim task force of the American Civil Liberties Union of Eastern Missouri. Sometimes complaints are settled easily, he said. For instance, a misunderstanding in March involving an employee at a high-end hotel in Clayton, Mo., was told to shave off his beard. The company made an exception to its policy on facial hair after it was explained that the employee wore a beard for religious reasons. Other incidents seem more serious. On Monday, two of Hacking’s Muslim clients filed a lawsuit in St. Louis County against Bankers Life and Casualty Co., and Daniel Colvis, a branch manager inChesterfield, Mo., alleging violations of the Missouri Human Rights Act. Ali Badran and Warrad Warrad, of Florissant, who were sales agents at the life and health insurance company, claim that Colvis “repeatedly made disparaging and defamatory comments” about their race, religion and ethnicity in front of other employees. Colvis is accused of making hostile comments to the plaintiffs including, “Please don’t blow yourselves up.” He allegedly told Warrad to shave off a neatly trimmed beard and asked both of them if they were related to Osama Bin Laden and if they danced on 9/11. Colvis fired Badran in 2009 and Warrad in 2010, even though they had stronger sales histories than non-Muslim agents, according to the lawsuit. At his office Friday, Colvis declined to comment on the lawsuit through an assistant and forwarded inquiries to the company’s corporate headquarters in Chicago. “We believe the lawsuit is without merit, and we intend to defend it vigorously,” said spokeswoman Barbara Ciesemier, declining to respond to follow-up questions. Last Sunday, a threatening note and three burned Qurans were reported at a mosque in Springfield, Mo., that was vandalized in January. “A lot of this is generated by Internet hate,” said Ibrahim Hooper, spokesman for the Council on American-Islamic Relations in Washington. 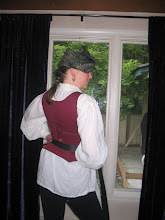 Clothing in particular has been in the spotlight this week. A new law in France took effect Monday forbidding women to cover their faces in public. Women reportedly risk a $200 fine; males face a $43,000 fine if they force women to wear a veil. Hussaini, of Manchester, said she wants to be covered and is thankful to have the opportunity to do so inthe United States. She dons an abaya, or full-length outer gown; hijab, or head scarf; and niqab, or veil. She admits that kids can be startled by her appearance in public. “Mommy, there’s a monster,” is one comment she has heard. But she said some mothers ask Hussaini to explain to their children why she wears what she does. She eventually found a mattress, but not an apology. Goodman, the company spokeswoman, said a regional salesman followed up with the Hussaini family a couple weeks ago to apologize and invite them back to the store. Syeeda Hussaini said that has not occurred. Shaken after the visit to Mattress Firm in March, the Hussaini family went to other companies in the area. “They let me try out all the beds and they were fine,” she said. She ended up buying her mattress online. (c) 2011, St. Louis Post-Dispatch. These unfortunate women were accused of prostituting themselves to U.S. military and American contractors and were dispatched by the Taliban. The women, dressed in blue burqas, were shot and killed just outside Ghazni city in central Afghanistan, said Sayed Ismal, a spokesman for Ghazni's governor. He called the two "innocent local people"
Amazing! The politician in this don’t even know that Islamberg exists in their own state. Let alone that this is a NO GO ZONE in NY- there are more no go zones. They just don’t want to admit it. Want to see another also in NY? Why don’t they know? Why doesn’t the vast majority of the US know? Why do the Muslims think we are stupid? So, you see the ISLAM and the PROGRESSIVES are one an the same. Until there is only those two and then you’ll see the difference. No matter, it’s all bad either way you slice it. 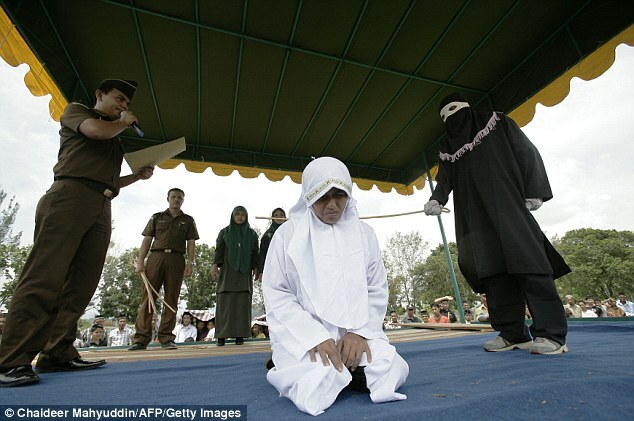 Indonesia – Sharia Law – Woman caned and her boyfriend – woman was in process of a divorce. So, this is what women in Germany can now expect as a STANDARD as well. Germany has acknowledged it’s a Caliphate by renouncing German laws. Isn’t this the wonderful and HOLY country that Barak Housein Obama hails from? Senior that is. We all know that POTUS Obama could never lie about being born there. Could he? /sarc intended. A woman flinches as she is about to be repeatedly caned for having an extramarital affair. 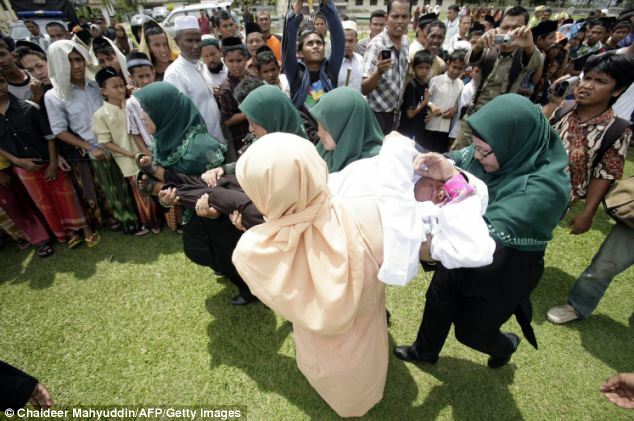 Irdayanti Mukhtar, 34, received nine lashes by Sharia Police for having a relationship with another man, even though she is said to be in the process of divorcing her husband. 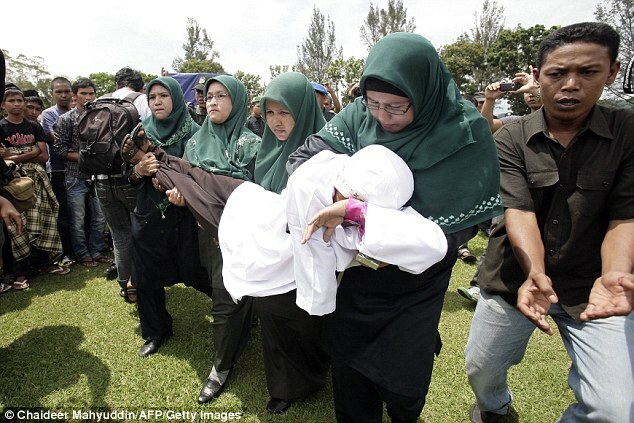 The harsh punishment was meted out in front of a crowd of 200 people outside the Al Munawwarah Mosque in Jantho, Indonesia. The jeering crowd recorded the brutal beating on their mobile phones and camcorders and shouted for more beatings in the strict Muslim city. Mukhtar had been sentenced to the punishment the previous day by a Sharia court where prosecutors said that she was guilty of being in ‘close proximity’ to another man. Under Sharia law the offence carries a maximum beating of nine strokes with a cane or a minimum of three. Neighbours had seen Mukhtar with the man and had barged in on her while the couple were in her bedroom, although it is unclear what they were actually doing. The mob then dragged them to the local police station to be charged. It is believed Sharia Police are also investigating a claim that Mukhtar was molested by the crowd before they took her to be charged. Shortly after the caning on Friday Mukhtar passed out and had to be taken to hospital for treatment. She was one of four people, including the man she was caught with, to be caned for extramarital affairs. I guess Germany is now a Caliphate – no need to visit now. If they get married by phone, then could they stay married without ever seeing each other? Might reduce the number of wife beatings? Oh, but if she ever wants human contact then what? She may have to get stone is she is seen with or next to a man. Two Pakistanis got married by phone, the woman never once having met the man. A German registrar refused to recognize the legitimacy of their marriage but has now been overruled by a court. Although German law requires marriage partners to be physically present with one another when the marriage takes place, foreign laws and customs should prevail, the judges said. Wife beating is old stuff, just like judicial discounts for honor killers and murderers of German citizens. New is the oriental marriage, which will add a whole lot of secret herbs and spices to the multicultural environment that has made us so much richer. Germans can only marry personally and in the presence of both marriage partners according to German law. So, if the marriage contract is drawn up according to sharia, Islamic law, who could possibly object? Zwar kann nach deutschem Recht eine Ehe nur persönlich und in Anwesenheit beider Ehepartner geschlossen werden. Aber das gilt nur für Einheimische. Auch andere “Bräuche und Rechtsregeln” (a.k.a. Scharia) werden anerkannt, wenn die Ehe nach diesen geschlossen worden ist. So musste sich ein Standesbeamter in Deutschland, der sich geweigert hatte, eine am Telefon geschlossene Ehe, zweier sich unbekannter Ehepartner für gültig zu erklären, vom Gericht in Zweibrücken belehren lassen. Entscheidend sei, ob das ausländische Recht diese Form der Eheschließung zulässt – die Scharia ist demnach im Zweifelsfall in Deutschland verbindlicher als das deutsche Recht.